THE ENTIRE SITE IS 25% OFF, and you get FREE SHIPPING for orders over $49. BAM. Another thing I want to point out is that there are new little bundles that they put together. These little groupings are already a reduced price, and then they also qualify for the 25% OFF! We’re talking crazy good deals, girls! From left to right in the pics below: the general a.m. routine, the general p.m. routine, the mask bundle, and the special treatments bundle. Just click on what you are interested in! And as always, if you already know and love the brand and want travel sized products, you need to check out the Discovery Kit (that’s already a reduced price) for an additional 25% OFF right now! OR if you’ve wanted to try some things, but haven’t known where to start, this Discovery Kit is a great option for you too. It contains many of their most popular products and would be a great way to give them all a try! I’ve had many readers say that after giving the Discovery Kit a shot, they are now loyal users. With the exception of the face oil (it’s a bit to oily for my skin, but my mom absolutely swears by it and says her skin “drinks it up”), I absolutely love everything in the kit. I started out with a couple of products that I received as samples, and over the years, I’ve tried most of the items in the line. And y’all. I’m hooked. 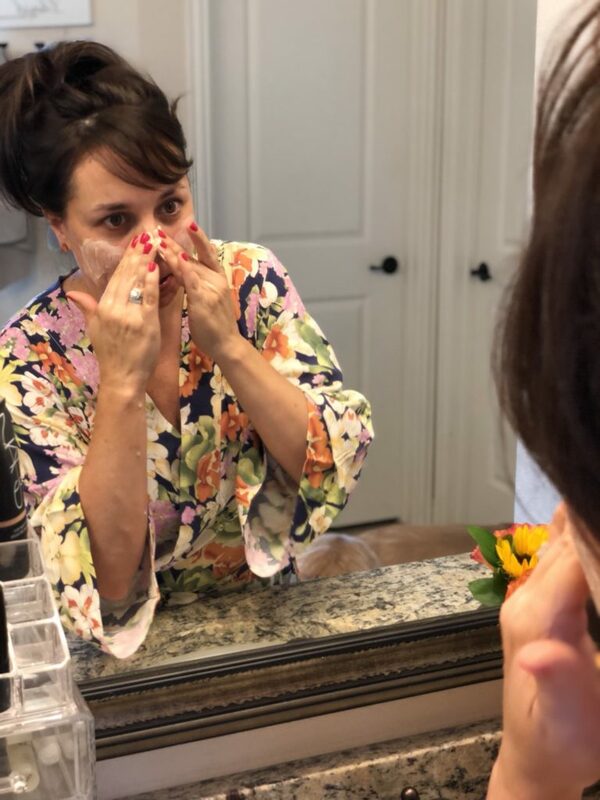 So is my mom (click HERE for my mom’s review of her favorite products and to see a picture of how awesome she looks!). So is my sister (she did a review too, but I can’t find it!). So is my cousin. And I found out just last weekend that my sister-in-law is also in the fan club. It’s a family affair over here. I also have MANY friends that are now swearing by the line as well, and my mom has converted some of her friends too. THE PRODUCTS ARE JUST THAT AMAZING. Let’s start out by talking about my skin type. Right out of the gate, let’s talk about the fact that my skin is super sensitive. Like, I can’t use make up wipes (I’ve tried, believe me I’ve tried), and a drugstore mask once turned my face purple. Seriously. PURPLE. I wouldn’t say that I’m consistently oily or dry, although I do tend to lean towards dry. However, in the past, heavy creams and/or oils have caused me to break out on occasion. So, how did this post come to be? I had the privilege of meeting with Colleen and her husband Stan in person at the blogging conference I attended in April. (I’m totally kicking myself for not getting a picture with them! You should see the woman’s skin!) I shared an idea I had with her to dedicate an entire post to my skincare routine and titling it “Colleen Rothschild Told Me To“. She was tickled and immediately on board. I let her know the two main issues that I’m working hard on targeting are 1) diminishing lines around my eyes, and 2) reducing the appearance of dark spots. And of course, in addition to those problem areas, I just want BRIGHT and HEALTHY skin! In short, I don’t want my skin to show my age! 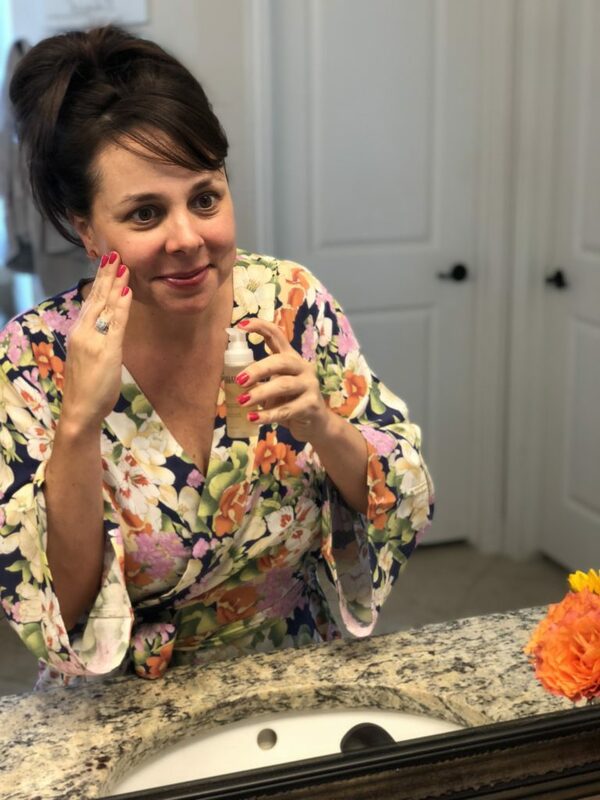 Colleen got a good look at my skin, and with the knowledge of what I was wanting to improve, she created a morning and evening routine JUST FOR ME! COLLEEN ROTHSCHILD TOLE ME TO, Y’ALL. 🙂 Let’s get started. Just a pea-size amount will do, and it will soak in pretty quickly. While it soaks in, you can apply your eye cream. Will give you a smooth, hydrated (but oil-free!) canvas for applying foundation. I use two different Colleen products to wash my face. Sometimes I use this gel cleanser, and sometimes I use a balm (which we will talk about in my nighttime routine). This cleanser is so mild, but it gets the job done and leaves my face feeling oh so clean. I use just 2 small pumps (1 pump if I’m not wearing eye make-up), so it lasts forever. I was worried that a gel would dry me out, but it doesn’t at all! I’ve had several readers tell me they leave it in the shower to use there, but I just keep it by the sink as part of my morning routine. It just leaves me feeling fresh faced, and ready for the day! You can find my robe HERE! I’m wearing a small, so it’s true to size. I’ve heard from my mom my entire life that the area around my eyes is so sensitive. She would scold me every time she saw me vigorously rubbing eye make up off with a rough rag and soap (in high school). TIP: I now use baby wash cloths when I wash my face! They are so gentle and soft. Now, as an adult, I feel like the fine lines around my eyes are the only place I’m dealing with any real lines/wrinkles at this time. I guess Mom was right! I now use my ring finger to ever so delicately dab the eye cream around my eyes. Let’s RESTORE SOME ELASTICITY, ladies! I would definitely say that the skin around my eyes is less puffy and noticeably smoother! I love how this cream is moisturizing and plumping, but it’s not greasy or heavy. Now, I don’t have issues with fine lines around my lips, but Colleen suggests you can use it there too! The sheer renewal cream is the most recent addition to my routine. I was using a moisturizer from another brand that I loved, and I was scared to change it. So many moisturizers I had tried in the past broke me out, others didn’t hydrate me enough, and others left me feeling greasy! I feel like finding a moisturizer you love is really difficult, so I didn’t want to mess with what I had going on. However, when Colleen recommended this product, I didn’t want to talk about it until I tried it myself. So, I held my breath and tried it out. And I loved it. My skin feels hydrated, but not greasy at all, and it creates a dewy look. And it’s fantastic under make up! Take a quarter-size scoop in dry hands and apply to a dry face. (Dry is the key!) The Balm will melt with the warmth of your hands and turn into an oil, which helps breakdown long-lasting foundation, mascara, etc. The Balm won’t strip the natural oils from your skin, so it’s not drying or stripping the skin. You can apply a thick layer, then wet the muslin cloth (included) with hot, hot water. Lay the cloth over your face and allow the steam to melt the Balm into your skin and clean out those pores! After the cloth has cooled, wipe away the Balm. The muslin cloth with rinse clean under water. It’s really a spa-like experience, and I actually look forward to washing my face at night! Take a small, dime-sized scoop and apply on your entire face. I love the bouncy, thick texture of this cream. This isn’t just my favorite, it’s a fan favorite for sure. This balm has a cult following and people can’t sing it’s praises enough. It totally changes the taking off your make up game, and I’m telling you, you won’t even dread washing your face at night. I KNOW. That’s a big claim, but I stand behind it. You scoop out a small amount of the balm with dry hands and slather it on your dry face. As you rub, the heat from your hands changes the balm into more of an oily texture and it just feels incredibly luxurious. It melts make up away, leaves your skin feeling amazing, and the light citrus smell is PERFECT. Even though this balm is the cleanser that Colleen personally recommended I use at night, I often use this in the morning too. If my face is on the dry side when I wake up, I will use this instead of the gel cleanser for a little extra hydration. I’ll rub it on my dry face and leave it for several minutes before washing it off. And on the random days that my face is really dry, I’ll use the dual enzyme polish (which I will talk about in a bit) before using the balm to slough off any dry skin. The pictures today are without any make up or filters. Don’t you think my skin looks really healthy and glowy? Let’s make “glowy” a word. I apply this all over my face and neck, and I can see why many reviewers choose it as their favorite product. Once I start using it consistently, I expect to be able to describe specific results I’m seeing. The Extreme Recovery Cream is thick and rich and heavenly. I mentioned before how the face oil is too much for my skin (although my mom swears by it), but this provides a huge boost of moisture for my skin and helps it feel plump and cared for. The Retinol Supreme Eye Serum is another new addition to my routine, and I feel like it’s really helping to reduce puffiness and increase firmness around my eyes, which is definitely a problem area for me. I typically keep it on my face for about 10 minutes (love the light citrus scent! ), and then I scrub my face in circular motions. Exfoliation is EXTREMELY important to combat against dull skin texture, and I look forward to using this mask about twice a week to improve my overall texure. The advanced microspheres deeply exfoliate and you can feel it taking off the dead skin, but it’s not too harsh! It leaves my skin SO SOFT and SO BRIGHT! Also, I’ve learned that exfoliation is such an extremely important step in your skincare routine, because it helps make the face ready to absorb all of the other products you are using (and paying for)! It helps make everything more effective, and you feel like you are giving yourself a mini facial when you use it! My skin really does feel baby soft after using this polish. And remember, they have recently created a bundle with both of these treatments for a reduced price, and right now it’s an additional 25% OFF! TREAT YOURSELF to these products! The pair is normally $103 when purchased separately, but right now they are $66.7o for the pair! WHAT A DEAL! And please, take however long you need to OOOH and AHHHH over the chubby baby face in the background. 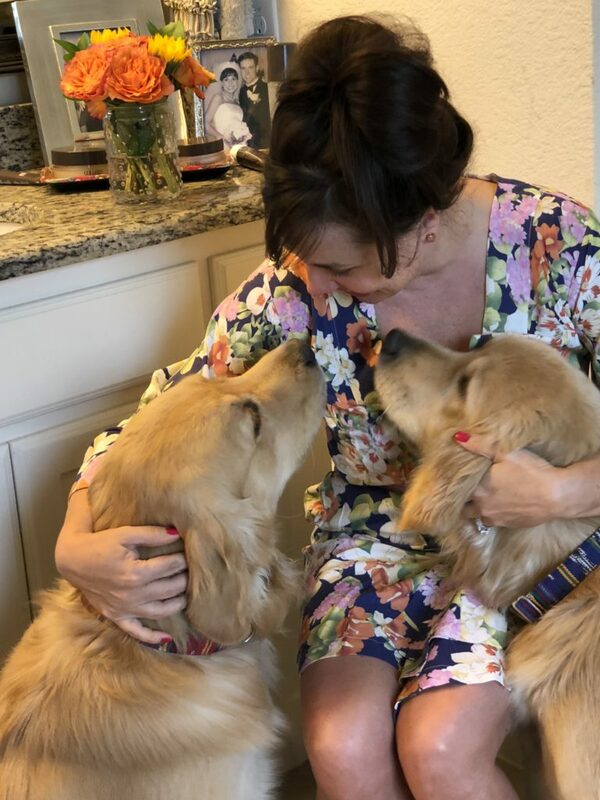 A huge thanks to Colleen Rothschild for personally building these routines for me, for creating these amazing products, and for sponsoring this post! Taking good care of my skin just makes me feel good, and I know good skin care is an investment I will never regret. 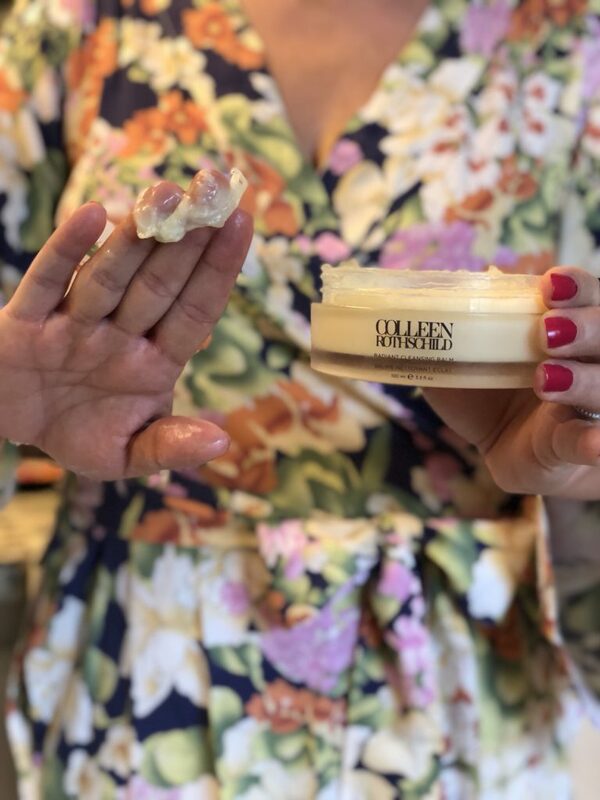 Now, if you are already a lover of Colleen Rothschild products, I would love for you to leave a comment saying WHAT product is your favorite and WHY! Sound off in the comments! P.S. More beauty product favorites! Oh Sheaffer! This post has me wanting all the products!! I mean…that night time cleanser sounds delightful! I’ve never tried her products before, but I just bought the dual enzyme polish this morning!! I can’t wait for it to arrive!! Yeah! Perfect timing and great review. I have been needing an updated morning routine. I have tried some of the products before and wanted to reorder. 25% off of a bundle too! Wonderful. Thanks for keeping us on top of our game. About how long does the cleansing balm last you? Enzyme polish? Thanks! I know this won’t really answer your question but it might help… I bought the discovery bundle & have been using the cleansing balm that came in it nightly for a month & a half now & it’s just starting to get pretty low. I’ve probably used the enzyme polish 3-4 times & definitely still have a few uses out of it. I know those are sample sizes but I’m guessing I’d get at least a couple of months out of each in the regular size. Hope that helps a little! I have been using my full size cleansing balm since January and haven’t put a dent in it. A little goes a long way. It’s a great value! I love her products too, so I thought I’d add a perspective of someone who stuggles with oily skin and acne. (And at 38 I feel like I should be past that, but alas I’m not!) The salicylic acid treatment has been great. Sometimes I use it just once a day, but sometimes twice, morning and night. I also use the vitamin c in the morning and the retinol treatment complex at night. Love the two masks too, but due to my issues, I use the clarifying detox mask twice a week and the dual enzyme polish once a week. Love them both, though. Also, I tried the mandelic acid radiance serum because of all the rave reviews, but it just didn’t work for me. Possibly because it’s oil based? Who knows–not everything will work for everyone, I guess! I have oily skin too. Thank you for this info. I’d love to try the cleansing gel, sheer moisturizer, & retinol. Would this be ok for roseaca? I love this post and I LOVE these products. You are the one that convinced me to order in the first place! The Dual Enzyme Polish, Cleansing Balm, and the Extreme Recovery Cream are my jam!!! Need to order the retinol eye serum ASAP!! Super jealous you got to meet her! Thanks!! Do you find any issue with that? I have tried several CR products and the one that surprised me the most is the cleansing balm. I never thought I would spend that much on a cleanser, but I LOVE it. I’ve used it for about two months and it should last several more months since I mainly use it at night so I don’t mind the price. I also really like the dual enzyme polish and detox mask. I think I’m going to add the vitamin C serum to my morning routine to see if that helps. I’m using the mandelic acid and retinol at night and have not had issues with dry, flaky skin which has been great. I’m not positive I’ve noticed a huge difference, but I’m giving the products several months to truly evaluate my results. Most importantly, I actually enjoy using these products and have finally committed to a regimen that is fairly easy to maintain. I’ve been using CR for a year now and love it! It cleared up my troubled cystic acne skin when nothing else would. I use the Regular face wash, vitamin C, sheer renewal lotion and sunscreen in the morning and radiant cleansing balm, number 9 oil (just under my eyes), extreme recovery cream and saylisic treatment at night. I try to do a detox mask and the scrub once a week. These look amazing! I haven’t used any of her products but think I might need to try the face wash and extreme eye cream! Thanks so much for the suggestions! Your skin looks amazing! I currently use the extreme recovery cream. It smells so good and my skin feels so moisturized but not greasy. I love that stuff! You have me wanting to try ALL Colleen Rothschild’s products!!!! But if I HAD to choose 2 it would be the Vitamin C Treatment Complex & the Retinol Supreme Eye Serum. Radiant cleansing balm is my favorite. It is so soothing. I love how it melts on my skin and smells great!! I think I am going to try the vitamin c next! I want to try the vitamin c treatment and the sheer renewal cream. In the past year my skin has made some serious changes and need to find a product line that not only will hydrate my skin but help me get rid of these awful fine lines appearing on my forehead and around my eyes. Would love to try the Vitamin C Treatment Complex because I have read on many blogs how this is the new “holy grail” and the Retinol Supreme eye serum at night. Thanks for the great info! I want to try the cleansing balm and sheer renewal cream! I haven’t tried the products but would love to try the extreme eye cream and the detox mask. Oh I’d love any of these products! I’ve never tried them. I’m turning 30 in 2 weeks and this gal’s skin isn’t what it used to be!! I’d love the eye cream and balance cleanser! Your skin looks amazing. I haven’t used the products yet, but I ordered some to try after reading your post. 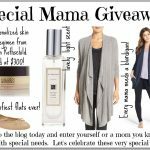 I would love to win a gift card to purchase the extreme eye cream and the dual enzyme polish. Haven’t tried CR yet, but I would definitely go for the Radiant Cleansing Balm and the Complete Eye Cream first. Your skin looks fantastic! Never tried the CR skin products before but would love the sheer renewal cream and the vitamin c complex treatment to try. Going to order the discovery kit I think. I ordered the assortment of products. I loved them all! The cleansing balm is every bit as fantastic as Sheaffer says it is! It leaves my skin feeling so moisturized but not greasy at all. I have ordered it and am going to try the serum. I honestly need to use up all the products I already have but that balm was a must have!! Hi! Thank you for this post! I’ve been thinking of trying her products and this might finally get me to place the order. I’m most interested in the Vitamin C treatment and Sheer renewal cream. I haven’t tried any of her products but I would like to try the eye cream and the charcoal mask scrub you showed. It looks amazing! Totally want to try that cleansing balm!! I am also looking for some anit-aging so the Mandelic Acid Radiance Serum looks good! Thanks! Love Colleen Rothschild Retinol Night Oil Supreme! I am very challenged when it comes to consistent product use, but this oil makes it so simple to moisturize my skin at night. I use 2 drops, literally and my skin texture is much better. Fewer fine lines, my color seems more consistent and no flaky, peeling spots. Love this so much I want to try more Colleen Rothschild. My favorite products are the Age Renewal Super Serum, I just started using it day and night and it makes my skin look really bright. And the second product is the classing balm of course, I actually WANT to wash my face at night now! I’ve have been contemplating trying these products for a couple of years. My hormone levels have changed due to Hashimoto’s and premenopause. It has all affected my skin. Ugh!!!! I would love to try the Discovery kit. Thanks for your posts! It really helps to know someone who has used the products. I bought the discovery kit several months ago and was hooked! Since then I’ve purchased the full sized cleansing balm, dual enzyme polish, face oil no 9, gel cleanser, hand cream, and intense hydrating mask. My skin was super dry after baby #3 and CR products were the only thing that finally got it back to where it was prebaby!! The products are pricey, but so so worth it!! And they last a long time because you don’t have to use very much! Love everything I’ve tried! Would love to try the cleansing balm and the polish. Lots of traveling this summer + sun time. Gotta take care of this skin! I would love to try the Vitamin C serum and the eye cream!! I’d love to try the Clarifying Detox Mask and Sheer Renewal Cream! I’ve been using Colleen Rothschild for about 6 months now and I’m hard-pressed to choose a favorite! Some in the running are the Vitamin C Treatment, the Sheer Renewal Cream, the Radiant Cleansing Balm – but the very one I don’t think I could live without is the Face Oil No. 9 which my dry skin just drinks up. I wouldn’t have thought to order it, but when I tried it in the Discovery Kit, I realized it was my “must-have”! The Discovery Kit is a great way to try so many of Colleen’s products. I am a fan! I haven’t used these products yet, but I just ordered The Discovery kit. Looking forward to using all the products…..especially the cleansing balm and the renewal cream. The cleansing balm is my favorite because it literally melts away your makeup! Cleansing balm and eye cream! The Clarifying Detox mask sounds perfect for me! And the Face Oil N9 sounds interesting…..thank you! I would love to try the vitamin C complex and the sheer renewal cream. I’d likje to try the sheer renewal cream and gel cleanser. I would love to try the cleansing balm. I am looking for a new makeup removing cleanser that won’t strip away and make my face dry. I’ve been wanting to try these products forever! I especially would like to try the eye serum and the vitamin c serum. I’ve never tried her products, but keep hearing about them. I’d love to try the dual enzyme polish and the mask. But all of them look awesome. I’m a skin care lover- so quality products are something I am always looking for. Haven’t tried these but am very tempted. The dual enzyme polish and the cleansing balm and vitamin c all sound really good. Would love to try the cleansing balm and the moisturizer! Thanks for the info on this skincare line. I’ve never used these products before, but I love skincare! I would most want to try the clarifying detox mask and the radiant cleansing balm! Would love to try the vitamin c treatment and the dual enzyme polish…. and all the other products… LOL! I’d love to try the Radiant Cleansing Balm and the Complete Eye Cream. Also the Vitamin C Treatment Complex! All her products sound amazing after reading your review! I had a sample once of the Mandelic serum, I think it was? I really liked it! I’d love to have a full size. P.S. I’d love to try the dual enzyme polish as well! I really want to try several of her products. But I think the eye cream and vitamin c is what I would start with. Love CR products. I really want to try the Vitamin C. I use the Dual Enzyme Polish faithfully and notice a difference. I enjoy the clay mask as well- usually twice a week.The Intense Hydrating Mask is a MUST during the dry winter months. I have not yet tried Colleen Rothschild products, but have been hearing so much about them! I would love to try the Balancing Gel Cleanser and the Retinol Supreme Eye Serum. They both sound great! I have used the Radiant Cleansing Balm in the past and love the way it removes my makeup. I have oily skin and it gets it clean. I would love to try the Vitamin C Complex! I love the dual enzyme polish! The gentle exfoliation is great for my skin and I love the citrus scent. It’s so good! I haven’t tried these products yet but I would want to try the dual enzyme polish and the eye serum! Hard to choose, they all sound amazing! I need something to tighten the skin around my eyes and for those dang dark circles! I would LOVE to try any of these products. When I say I’ve tried everything on my skin, I really have and can’t find anything to stick with! Ugh!! I would live to try the eye renewal and of course the balm! I’m willing to try anything at this point. Ive been dying to try the eye cream and sheer renewal cream since you first mentioned Colleen Rothschild with your mom’s review. And after your more recent posts, I’ve seriously been considering the cleansing balm. I have yet to bite the bullet though. My skin is SO particular and very sensitive. And, while I don’t feel like my current products are doing what I want them to, I am always leery of changing things when it comes to my face. I’ve been looking at these products for awhile. The radiant cleansing balm & dual enzyme polish are two products I definitely want to try! I would love to try the Mandelic Acid Radiance Serum and the dual enzyme polish. 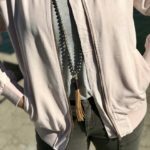 Between your blog and “Honey were home” I am a believer! I haven’t tried these products yet, but I really need a new routine! I would love to try the retinol eye serum! Thank you for thinking of us with this giveaway! I have never tried CR products so I’d likely use a gift card on a discovery kit or one of the eye serum or mask bundles. My skin has changed so much (in my 40’s) with kids, age and thyroid issues – all of the products look amazing. Thanks again, Sheaffer! I have not used CR products yet! I’d like to try the vitamin c treatment and mandelic acid to treat dark areas on my skin!!! I haven’t tried any of her products but I would like to try the eye cream and the radiance serum. Thank you! I have started trying these products in the last few month. So far my favorites are the sheer renewal cream and the complete eye cream. I am hooked! I bought the discovery bundle and loved how it made my skin look and feel but now want to try some additional products, like the age renewal serum! I first bought the travel kit to try them all, but my favorite is the cleansing balm. It leaves my skin feeling so clean and soft. I love how it melts in your hand. A little goes a long way! I would love to try the retinol eye serum and the cleansing balm!! & why do I use them? Because they make my skin feel like a baby’s behind… THAT is why!!!! Seriously, it’s soft as butter & my skin has changed so dramatically. Nothing has come close to working like Colleen’s products have & I’ve tried many. I follow the application rule of hairline to breast line & I never miss the back of my hands! If anywhere will show your age, it’s the back of the hands…maybe because people treat their face, etc & not there? Regardless of the why, I don’t want mine to be my dead giveaway, so they get it too! I literally have no idea how it’s possible, but all of the CR products just keep making my skin better & better with each new one I try… THEY. ARE. AMAZING!!! On your recommendation, I got the Discovery Kit on Black Friday. 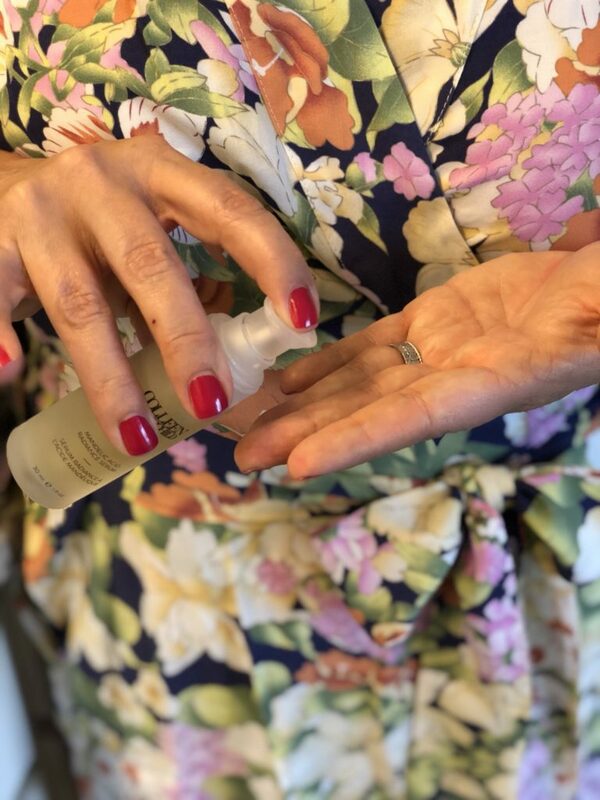 LOVE the products and think the Cleansing Balm is a game changer – especially for mature skin. My skin has never looked better. Age 65 and still in the anti-aging fight! Dying to try the cleansing balm and eye serum!! Looks amazing! I would love to try the eye cream and dual enzyme polish. The products sound great! I found Colleen’s products through you and gave them a try. I’m a convert! I love, love, love the cleansing balm. I never thought a balm would work for my skin, but this stuff is amazing. I’m interested in trying the retinol night oil or the age renewal super serum. I guess this is a good time since they’re on sale! I just ordered the discovery kit thanks to you but I’m also really wanting to try the eye cream! I have never tried these products before but after your review, I feel like I need to jump on them. The balm sounds amazing and the Vitamin C can only help, right? I’ve not used her products before but as my skin “matures”, I’m always listening for other women’s top products. That cleansing balm gets AMAZING reviews and I want to smell it! All the reviews talk about how well it works and how beautiful it smells! That dual enzyme polish is something I’d love to try as well–I love when my face is freshly exfoliated. Your skin looks incredible, Sheaffer. I love the dual enzyme polish! It makes my skin so refreshed and the smell is amazing!! I haven’t tried any products yet, but am definitely interested in the eye serum and the Vitamin C treatment complex. Thanks for letting us know about these! I have heard lots of great things about Colleen Rothschild but just haven’t bitten the bullet and done it yet. I’m super interested in the Vitamin C treatment and the complete eye cream! Like you, I love how the dual enzyme polish leaves my face so soft. I haven’t tried her products yet, but would love to try the retinol a supreme eye serum & the mandelic acid radiance serum. Or, I feel it counts the discovery kit! 😉 thanks so much! I’ve never tried CR products, but I would try the eye cream or serum and the discovery kit to get a taste of them all! Happy Friday! Thanks for sharing! LOVE everything but the Sheer Renewal Cream is something I can’t be without! It delivers the perfect amount of moisture without feeling heavy or greasy. I’ve never tried it, but I am most interested in the balancing cleanser and the vitamin C treatment complex! I would definitely like to try the Vitamin C Treatment Complex and Sheer Renewal Cream! I’ve always wanted to try these products!! I have acne prone skin and have used Clinique religiously for as many years as I can remember. I would love to try everything….but the detox mask and vitamin C treatment would be top on my list! Better yet the discovery kit so I could try everything! 😉 Thanks for sharing!! I got the discovery set a while back and have been adding full size products when I can. I love the cleansing balm the most, and the age renewal super serum. Those are the two things I use everyday. I just ordered the morning a.m. bundle and can’t wait to try the gel cleanser and vitamin c treatment. Would love an excuse to get more!! I haven’t tried any products yet. I ordered the complete eye cream on May 16th (Because of your post!!!) and can’t wait for it to arrive. I would also LOVE to try the retinol supreme eye cream. – My eyes show my age!!! I haven’t tried any of the products, but the eye creams and cleansing balm are intriguing to me! I really like the dual enzyme polish. Makes my skin feel great. I would love to try some more products! I ordered the discovery set and can’t wait to try it! I’m especially excited about trying the dual enzyme polish and the eye serum! I LOVE the clarifying detox mask! I use it occasionally all over my face and it always leaves my skin feeling tighter and extra clean. BUT my favorite way to use it, per your suggestion, is a spot treatment for my blemishes. I swear by it! So thank you for the suggestion! I would love to try the Radiant Cleansing Balm and the Dual Enzyme Polish! I swear, I turned 40 and father time busted out his age-spot airbrush and went to work on my face! I mean…what did I ever do to him?!?! I absolutely love Colleen’s products. My can’t do without are the extreme recovery cream and the retinol oil. Both are must haves for sure! I’ve been using the Dual Enzyme Polish and I love it. It removes all my dry skin and leaves my face feeling so smooth. I can’t wait to add more products into my routine. I just ordered the vitamin C treatment complex because when Sheaffer tells me to…I do! I would like to try the Dual Enzyme Polish and Vitamin C. Actually, I want to try everything, because it all sounds amazing!! Great post! Would love to try the dual enzyme polish & the clarifying detox mask. I really want to try that cleansing balm and enzyme polish! Thank you for highlighting these products! I have many of her products but my favorites are the cleansing balm and detox mask. I actually enjoy cleaning my face at night! I just ordered the mandelic acid serum because of your review, excited to try it! I haven’t tried any of the products yet but I have the same issues as you (fine lines and dark spots) along with combination skin. The products sound great but I have to be careful about “heavier” products or they can make my skin oily. I am so intrigued by the cleansing balm and would also like to try the Vitamin C treatment complex. Thinking I should try the sample kit to start with though and see what products I like best. Everyone is raving about these products, I guess I need to give in and try! I’m DYING to try the cleansing balm and of course the eye cream (bc this lady’s gotta stay looking fresh)! i love the cleansing balm and the recovery cream…just ordered the whole morning kit!!!! I really want to try the discovery bundle (because who doesn’t love trying everything at once) and the sunscreen that I found on her website. The bundle is pretty explanatory but the sunscreen is something I battle finding for my face and am hopeful that this will be the ticket!. I would love to try the complete eye cream and vitamin C treatment complex. All of the products sound amazing and would love to try each of them. Great post! I have never used her products but you got me interested!!!! I would LOVE to try the Extreme Recovery Cream and the Mandelic Acid Radiance Serum! Who doesn’t like radiant skin??? I love the clarifying detox mask! It leaves my skin feeling so clean and soft and just makes you feel like you took some time for yourself 🙂 I would love to try so many more items though too! I got the discovery collection a couple of months ago and I honestly I love everything in it, but my favorite is probably the sheer renewal cream! Such a perfect day moisturizer! I love the Sheer Renewal Cream. It doesn’t break me out or leave me oily. I also love the dual enzyme polish. My skin feels so smooth after using it! Have tried the body lotion and hand cream and love them!! Would love to try more ! I just placed my first order. Looking forward to trying the products! I admit it. I was skeptical. This coming from someone who has tried practically every skin care product at that big name make-up store and have the points to prove it! But oh my goodness. I so stand corrected. I love, love, love these products and finally feel like I have found a lifetime routine. I am all about the Radiant Cleansing balm (you are so right. I used to hate to wash my face, but really look forward to it now), the Extreme Recovery Cream and the Enzyme Polish. Just started the Mandelic Acid Radiance Serum at night and the Vitamin C Treatment Complex during the day. I can really tell a difference in my skin’s texture and suppleness (is that word?) and am looking forward to having these pesky dark spots diminish! Thank you so much for posting about Colleen Rothschild. Can’t say enough good things about these products, and am about to get my 25-year old daughter started, too. Great feedback, Diana! THANK YOU!!!!! I just started using the Complete eye cream and really like it. I want to try the whole pm routine! I definitely am interested in trying the vitamin C cream and the eye cream….. I am beyond loyal to the intense hydrating mask, and the Vitamin C. Just ordered the retinol eye serum! Cannot wait to try it! 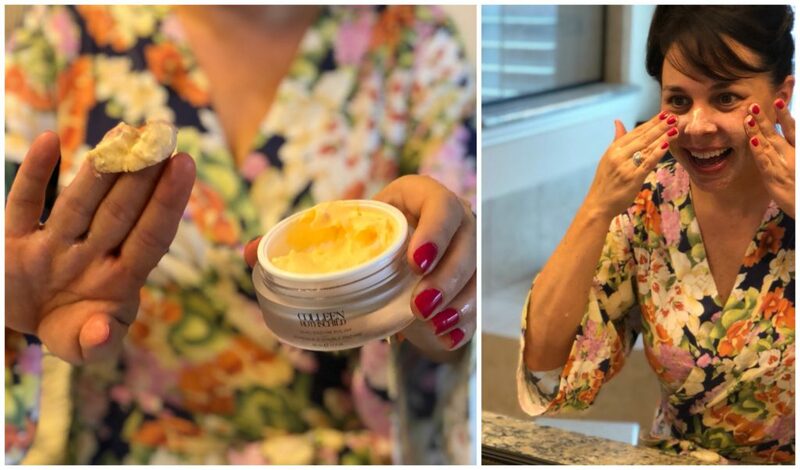 The radiant cleansing balm is my favorite – I love, love, love it. I have very sensitive eyes, but you can remove your eye makeup with this without irritation. It leaves your skin clean, soft, but non-greasy. I also love the way it smells!! 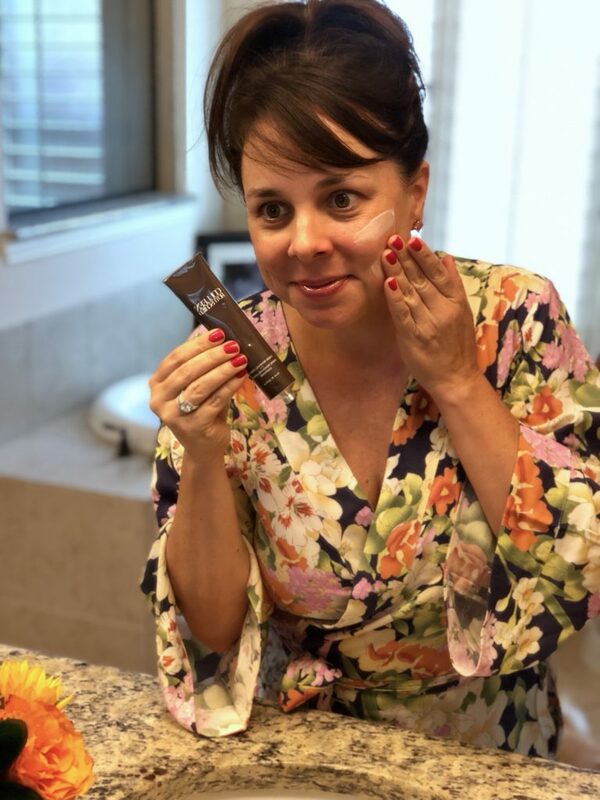 I also like the spf mineral sunscreen – it’s a very thin liquid and absorbs nicely, it’s different than other sunscreens I’ve used. I’ve actually loved every CR product I’ve tried!!! I am most interested in trying the Vitamin C Treatment Complex and the Retinol Supreme Eye Serum. Hello!! I LOVE the radiant cleansing balm!! It is my favorite skin care product I have ever used! It feels great and makes my face feel super soft and clean. Thank you for highlighting these products! I haven’t tried CR yet but have been wanting to. I would love to try the balancing gel cleanser and the dual enzyme polish. Thank you for having this giveaway! My favorite is the clarifying detox mask! It makes my skin feel so smooth and clean! I’ve never even heard of these products before but now I want to try one of everything! I have not used these products before but I would love to try them! The Discovery Kit would be a great way to try many of the products, I would also be interested in the radiant cleansing balm and the complete eye cream! Thanks for the post! My favorite is the radiant cleansing balm. But I also love the way the dual enzyme polish makes my skin feel. I haven’t tried any products yet, but was looking at the eye cream, which has AMAZING reviews, and the mandelic radiance serum. I would LOVE to win this. I would like to try eye cream & face oil ! Thanks for offer Scheaffer! Really interested in trying the Vitamin C Complex – I read about this all the time but have no idea how/when to use it or what a good one is – so this is helpful. Also I’d love to try the Radiant Cleansing Balm – with the face cloth. Sounds heavenly!! Thanks for the post. I haven’t yet tried her products, but I’m very interested. I’d likely start with the Extreme recover and Sheer renewel moisturizers. Thanks for all the info! I would love to try the clarifying mask, and the retinol eye cream…and so much more, haha! I would love to try the Balancing Gel Cleanser and the Eye cream. I love trying new products. I’d LOVE to try the dual enzyme polish and the mandelic acid radiance serum. I need to stop using drugstore specials on my face and start using products that will work! I actually just ordered the eye cream yesterday and can’t wait to try it! BUT I would also love to try the cleansing balm and the sheer renewal cream. Fingers crossed! I just spent a pretty penny buying an assortment of items to try. I’m looking forward to both the dual enzyme polish and detox mask as well as the Vitamin C treatment. Moisturizers aren’t as exciting, but necessary so threw those on board as well. Hoping I love them and can talk my Mom and sister into hopping on the CR train as well!! I would love to try the Dual Enzyme Polish and Clarifying Detox Mask! They sound amazing, and nothing feels like more of a treat than an at-home facial. Thanks for the great post, Shaeffer! I would love to try the cleansing balm and the complete eye cream! All of it sounds amazing! I would love to try the Vitamin C serum and the face oil! Vitamin C is a definite must! Love, love, love the cleansing balm! I started just using make-up removal wipes to wash my face when my daughter was born nine years ago & I’ve FINALLY found something that’s just as easy but definitely better for my skin. Slowly building up my arsenal of products & am so happy with everything I’ve bought so far! I have never tried her products but I am interested in trying the cleansing balm along with the cleansing cloth. Thanks a bunch for your wonderful blog!! I’d love to try their Renewal Super Serum and sheer renewal cream for my tired aging skin. I’ve been hearing a lot about her skin care line and your post has convinced me that I need to try it! I’m totally interested in the Vitamin C cream, the new Retinol Supreme Night Oil, and the Dual Enzyme Polish. I would love to try the Radiant Cleansing Balm and Mandelic Acid to reduce dark spots! Hi! I haven’t tried any of her products so would love to try both the AM and PM kits to get started and see what I like best :). Thanks! 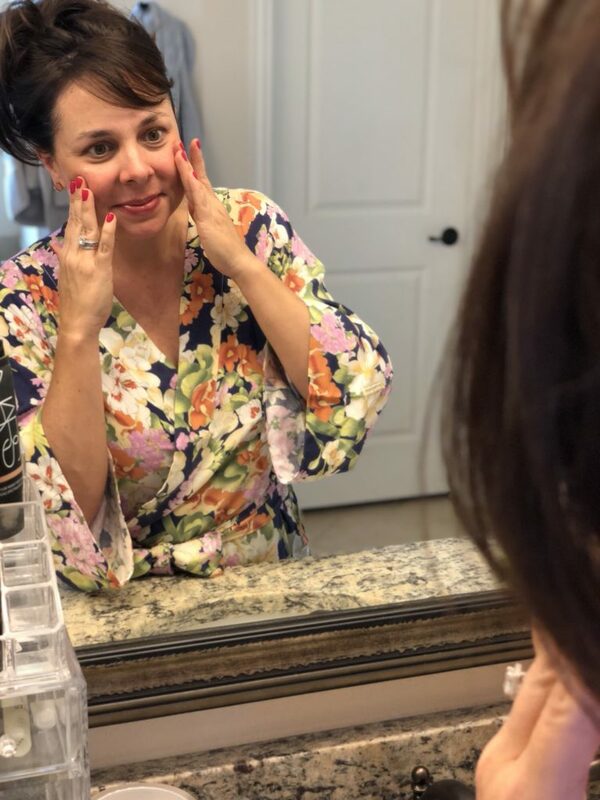 I have never used any CR products… and at 50 I probably need a skin care routine! Someone in the comments mentioned being 38 with oily skin; I’m 50 and have oily skin, so products targeted to my age group tend to make me extra oily. I’d love to try some of the overnight retinol-based products. They just are so expensive it’s hard to pull the trigger. Thanks for the post, it’s really comprehensive! I’d like to try the Dual Enzyme Polish and Radiant Cleansing Balm. I want to try them all! I’ve been looking to up by skincare game and would love to try Colleen Rothschild! Would love to try the complete eye cream and the sheer renewal cream! These products look incredible! I haven’t tried them, but the two I’d like to try first would be the Dual Enzyme Polish and the Retinol Supreme Eye Serum. I really love the radiant cleansing balm. it goes on so smooth and really gets the eye makeup off without scrubbing and pulling. I have oily skin and this does a great job helping me control breakouts. I have not tried these products but the enzyme polish looks amazing as does the cleansing balm! Your skin looks fabulous! I have not tried Colleen Rothschild products but I would love to try the enzyme polish. I love the dual enzyme polish because it doesn’t irritate my sensitive skin, and leaves my face so soft and refreshed feeling. The salicylic treatment complex has made a significant difference in my teenage sons breakouts, and my occasional flare ups. Very happy we gave these products a try. I would love to try the Salicylic Acid Treatment and the clarifying Detox mask. I haven’t tried these products yet but I’ve been dying too and now seems like the right time! I’m most excited to try the Radiant Cleansing Balm and the Mandelic Acid Radiance Serum. The Cleansing Balm and the Extreme Renewal cream can’t be beat!! I would love to try the dual enzyme polish and the detox mask! I mean if I’m being honest I’ll do about anything Sheaffer tells me to. I would love to try the Complete Eye Cream and the Sheer Renewal Cream! I want to try EVERYTHING! AM routine, PM routine, masks, haha – I would really love to try the cleansing balm and the face oil. The discovery kit is calling my name…. do we know how long the friends and family sale will go for? I ah ent tried Colleen’s products yet, but I would love to try the Balancing Gel Cleanser and the Retinol Supreme Eye Serum. They sound perfect! Your recommendations are so helpful! I really want to try the face oil no 9 and the cleansing balm. We are stationed in Iraq right now and it is SOO dry, my skin always needs some extra love. I look forward to using the Radiant Cleansing Balm every single night! I bought the discovery kit last year on your recommendation and LOVED it. I just bought my first full size product during this sale and can’t wait to try the eye cream! I’m hoping to get those dark under eye circles gone! I am dying to try the cleansing balm and the retinol eye serum!! I would love to try the Mandelic Acid Radiance Serum and the Vitamin C Treatment. All of her products sound amazing. I haven’t tried CR products yet, but they have been on my list for while. So I finally ordered the Discovery kit and the Retinol eye serum yesterday. Can’t wait to try them when they arrive. However, I am also interested in trying the Vitamin C Treatment Complex and the Mandelic Acid Radiance Serum since it sounds so promising! Who wouldn’t want to have a luminous complexion!? I have loved all of her products….very simple routines and great results. I realize I haven’t tried the retinol eye serum or the retinol supreme night oil so that has to change right now. Does the retinol night oil replace the No 9 face oil (which I love) or is it in addition to the No 9 oil? Great post! I would be most interested in the balancing gel cleanser and sheer renewal cream. I’ve never used Colleen Rothschild products! Awesome products, to help us all feel pretty and pampered! I would L❤️VE to try the Radiant Cleaning Balm and the Dual Enzyme Polish…and more! My fingers are crossed.Thanks! I just started using this product line after seeing a post you did about a month ago, I am using radiant cleansing balm and I LOVE it!!! I have very oily skin and I feel like it gets my face really clean and gives me just enough moisture without being too much!!!!! Highly recommend it for oily skin. Love her products. My favorite would have to be the Dual Enzyme Polish. I purchased the Discovery Collection several months ago after reading about it on your blog. Would love to try some of the products you mention in this post. I’ve never tried her products before, but I would love to try the Cleansing Balm and Sheer Renewal Cream. I would love to try out her balancing gel cleanser and the intense hydrating mask! Hi Sheaffer! Loved reading your review. I have never tried these products but I am very interested in the Radiant Cleansing Balm and the Intense Hydrating Mask! All of these products sound amazing but the night time balm sounds amazing and the dual enzyme polish! I would love to try both of those products!! I would love to try the eye cream/serum and the detox mask! I haven’t tried anything in the past, but really need to start. At 34 I already have pretty visible smile lines. I’d like to try the Retinal Supreme Eye Serum and the Dual Enzyme Polish. 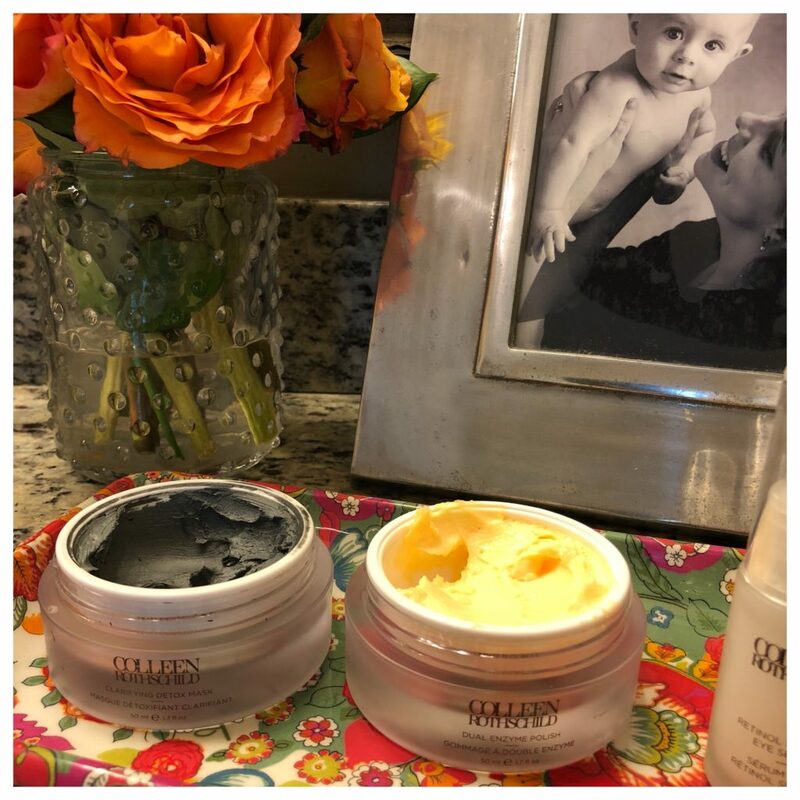 Cleansing balm and salcylic treatment – blemishes GONE! 🙂 I also want to try the retinol! Thanks Sheaffter! I would love to try the Retinol Supreme Eye Serum and the Sheer Renewal Cream. Heard wonderful things about these products so I would love try. I love the cleansing balm and sheer renewal; I’m dying to try the retinol!!! I’m intrigued with the polishing enzyme and the cleansing balm. Especially hearing that you have sensitive skin. Love, love CR products!! Two favorites are retinol supreme eye serum and sheer renewal cream. I missed out on the Mother’s Day sale, so super excited about this sale to scoop up some products. I’m looking forward to getting the clarifying detox mask and the radiant cleansing balm. I LOVE the cleansing balm and extreme recovery cream. Would love to try some of the other products you mentioned. Thanks! The cleansing balm and renewel cream! I so need to find another product to use! Thank you for all the detail and your skin looks amazing! Salacylic acid treatment and cleansing balm are the best combo for my oily skin. So good! The cleansing balm sounds fantastic and the Dual Enzyme Polish is something I need! I use a lot of Colleen Rothschild products!! I LOVE the eye cream. I am probably on my fourth jar of it. It moisturizes but can still be worn under makeup. I also love the cleansing balm, the gel cleanser and the dual enzyme polish. I just started using the retinol oil –too soon to report on that yet. The next item on my list to try is the retinol eye serum. I want to try the Radiant Cleansing Balm and the Dual Enzyme Polish. Would love to give them a try! I have $200 worth of stuff in my cart right now. I would love to try the recover night cream and the recover eye cream! I’ve never tried Colleen Rothschild products but would love to try the dual enzyme polish and the vitamin C treatment! I have never tried Colleen Rothchild’s products, but just placed my first order. I ordered the morning skincare bundle and the discovery kit while it was 25% off. I can’t wait to try! 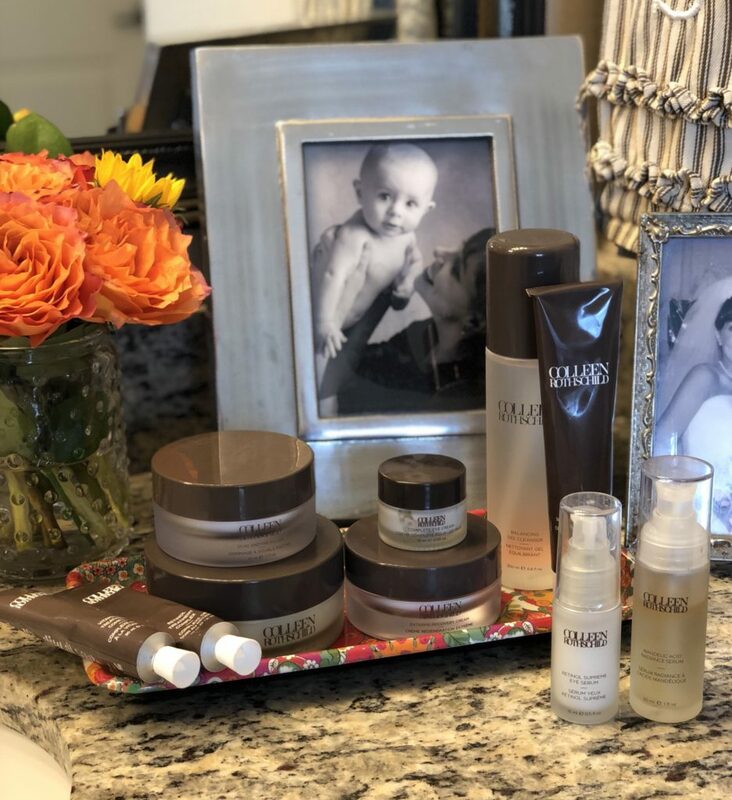 Just like your mom, I’ve been wanted a new skin care line! I would love to try the dual enzyme polish and any of the eye creams !! I’ve tried the dual enzyme polish and loved it! I would like to try it again along with the mandelic acid radiance serum. I suffer from cystic acne as well so this post was just what I needed! I haven’t tried this line of products either, but I sure would like to! I think I would choose the Vitamin C treatment and the Detox mask. I’d love to try the Dual Enzyme Polish and clay mask! I would love to try the eye cream and cleansing balm. I’m in need of all new skin products but shy away from the expensive items so perfect way to try them out. I tried the products from the post you did last year. My favorite is the Sheer Renewal Cream, it’s very lightweight for under foundation and smells so great. I also love the balm cleanser and dual enzyme polish. I really want to try the dual enzyme polish and the eye cream that helps with wrinkles!! I’ve never used these products but they all sound great! I’d try the balancing gel cleaner and the retinol eye cream! I would love to try the vitamin c treatment and the eye cream! I don’t have a skin care routine and would love to try Colleen Rothschild products. I’d start with the eye cream and one of the serums. The retinol eye serum and dual enzyme polish are the first two products I’d like to try. Thanks for the give away!! I would love to try any of the serums and the enzyme polish. I want to try the Radiant Cleansing Balm and the Age renewal super serum. I couldn’t possibly choose just one favorite! 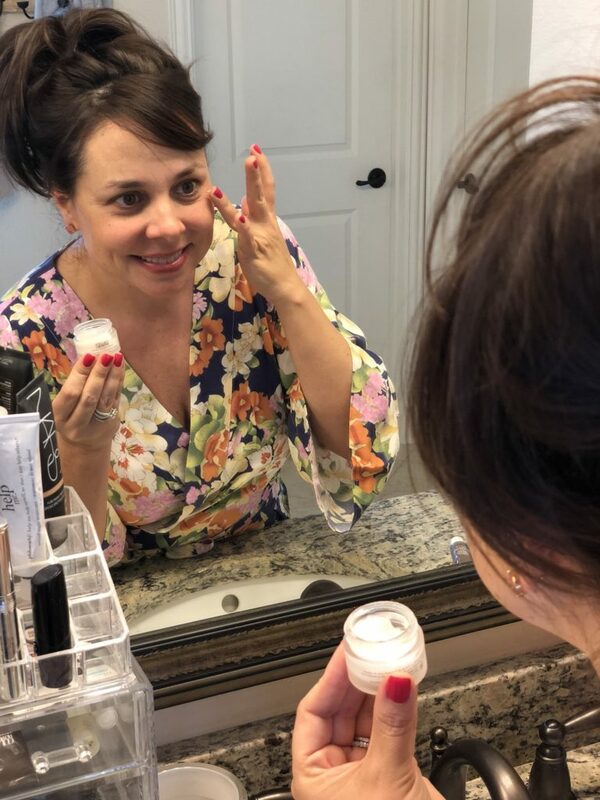 The sheer renewal cream is a moisturizer that also feels like you have roamed your skin so my make0up looks better too. The cleansing balm feels and smells sooo good and the Dual enzyme polish is terrific! I would love to try the serums now. I have and LOVE the Sheer Renewal and Recovery reams. I could probably add every product and sing their praises, but I am most interested in the Radiant Cleansing Balm and the Dual Enzyme Polish. I am a new user! Love all the Discovery Kit products! If I had to choose 1 product as my favorite, i would pick that amazing Cleansing Balm! Love everything about it!! It be been looking at this line for a bit. I would try the Mandelic Acid Radience Serum and Dual Enzyme Polish. I’ve used the Complete Eye Cream for about a year and would highly recommend it. It’s rich and smooth, just glides on and soaks into my skin, and has really helped with those little crow’s feet at the outer edges of my eye area. I so want to try the clarifying detox mask and the dual enzyme polish!! I would LOVE to try the cleansing balm and the eye cream. They all look amazing but those two are calling me! I’ve never tried any CR products but I would like to try the daily defense spf 25 and the restorative hand cream. Love your nail polish! Will you share the color please?! Thanks! I would most definitely try the Extreme Recovery Cream & Radiant Cleansing Balm. Both sound amazing. I am so wanting to try the cleansing balm and the sheer renewal cream!! And so many more… but those would be my top 2! I am in need of a good skin care regimen! Radiant Cleansing Balm is wonderful! I love the way my skin looks and feels after using it. 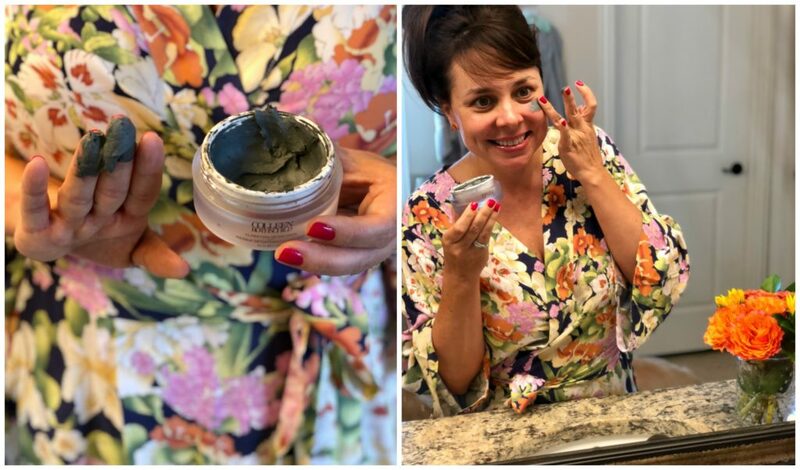 I bought the detox mask and the eye cream after reading your post…I love the products so far and I NEVER switch it up…I’m always afraid to try new things with my sensitive skin but I amso glad I took a chance! Would love to try the salicylic complex and dual enzyme. I bought the discovery kit a little while ago, and the sheer renewal cream is my favorite! I would love to try the Retinol Supreme Eye Serum and the Vitamin C Treatment Complex! Iaminterest in the Compele eye cream and the dual enzyme polish!! I would love to try these products. At age 75 and dealing with radiation for breast cancer, my skin is suffering. Thank you for giving us a chance to try them. Several months ago after reading reviews from you and another blogger I bit the bullet and ordered the sample bundle. Well, I was in love with the cleansing balm the first time I tried it! I also loved the face oil since it was during winter. Now that it is not so dry out, I haven’t been using it because it seems too oily for spring. My newest additions are the vitamin C complex and the Age Renewal Serum. These two products took my results to a new level. I truly have never noticed results from any skin care system I have tried and within two weeks of adding these products I really did see a difference! I have even gotten my husband to try some of the products and even he has liked them. The bonus is there is no heavy perfume scent to any of the products which I am beyond sensitive to! Thanks for introducing me to a great line! I love the Clarifying Detox Mask when I feel like my skin is breaking out. I also recently bought the Retinol Oil and I am loving it! It soaks in to my skin and night and I have noticed smaller pores, smoother skin, and reduced redness. You can’t go wrong with the Discovery kit. All the products I have purchased have lasted a long time! Ive been looking for a good retinol eye cream and something for brightness! My skin is acne prone now and very sensitive. Sounds like I should give these products a whirl! I bought the discovery kit a few months ago and loved every product. I love this sale to try more things!! I would love to try the dual enzyme polish!! I’ve heard great things about CR products! I have normal (to dry) skin. I can never use the makeup wipes either-my eyes are extremely sensitive. These products look and sound amazing! I’ve tried a number of the products and Iove them all but I’m obsessed with the cleansing balm! Would love to try the cleansing balm and enzyme polish for my dry skin. I use the balm for evening and the cleansing gel in the morning, but really want to try the eye cream or eye serum. Love their balancing gel cleanser and the dual enzyne polish!! The eye cream! But I would love to win some products! The dual enzyme polish is a great exfoliant and i love the citrus smell! Ive heard such amazing things about this line!!! I would love to try all of it! I turned 28 this year and vowed that I’d start trying to take better care of my face. I’m acne prone with combination skin so I’m interested in looking into some of these products more…and so is my mom! I’ll have to share this post with her. Love this review! I just started using some of these products and particularly like the balm. 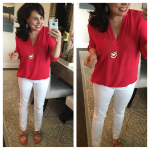 Thanks for sharing your experience – I’m definitely going to snap up a few more of her items! I’ve heard so many great things about these products. I can’t wait to give them a try! I would love to try the dual enzyme polish and the cleansing balm! They sound like great products!!! Those products sure do have a cult following. Good to know they are worth it. I need new skin care and would love to try this! About two weeks ago I made my first CR purchase and got the Age Renewal Super Serum, Mandelic Acid, and Complete Eye Cream. Not only do I love the products, but I loved the customer service response I got with some questions prior to my purchase and follow-up after. I hadn’t planned to make another purchase so soon but couldn’t pass up the Discovery Kit during the sale. That arrived yesterday (free shipping and so fast!) and I can’t wait to incorporate those products into my routine. Next on my list is the Vitamin C and the retinol oil to interchange with the Mandelic Acid. The cleansing balm is my fav and the travel packs is awesome! I am always game to try new skincare products. Thanks for sharing your thoughts on the products. My favorites are the radiant cleansing balm and extreme recovery cream. I am all out of the cream and almost out of the balm, so I’m due for a new order! How often do you wash your muslin cloth? They definitely look worth trying !! Thanks for such a detailed post ! I have been dying to try this–so glad you posted all these details!!! The cleansing balm is my favorite! I want to try the eye cream. I am in the market for a new face routine- just quit R&F. These products look amazing! I would love to try these products. Thanks for such an informative post. I’ve never tried her products but would love to. I would love to try that eye cream, fine lines be gone! I ordered the travel size kit to try! I’m super curious about the Vitamin C serum! I am obsessed with the cleansing balm and sheer renewal. I’ve always been so bad about sticking to a skincare routine and CR products are the only ones I’ve been able to stick with for about 9 months now. Just ordered the enzyme polish and vitamin c treatment. I got the discovery kit for my mom for mother’s day. She’s excited to try it all! I would really like to try the enzyme polish and sheer renewal cream. I would love to try this. Ive been researching something new (leaving Arbonne – not working anymore). Not sure if this will be in my price range or not. But would love to know if it works. I would love to try these products. 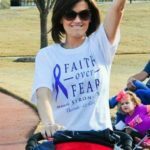 As a single mom, I need to do a better job of taking care of me. The two I think I would like to try are the cleansing balm and the detox mask. I’ve been having some breakouts lately, so I’d also be curious if she has any products to treat that! I’ll try one of everything! I’ve been wanting to try this line! Thanks for sharing! I have got to try that cleansing balm. 1. I dread washing my face at night (why is it so annoying?!) and 2. My skin is definitely on the dry side and this sounds amazing! This has made me want to try these products for sure! I haven’t tried her products, but I would love to try the detox mask and the salycytic treatment! I think the two I would like to try are the cleansing balm and the detox mask! Exactly what I need for a refresh! I’ve never tried them but I would love to try the complete eye cream and the retinol eye cream! They both sound fab!!! I love your step by step explanation!! I have never used these products but I would love to try the Vitamin C treatment complex and the clarifying detox mask! I LOVE the balm! It’s amazing. And the Dual Enzyme Polish! I can’t get enough…. Twice a week! It feels like a just got a facial!!!! I love the eye cream!!!! I swear my eyes look so much better after using this! Sorry if this is a repeat, but I don’t think my comment was going through on my phone! I think that the two products I would like to try are the cleansing balm and the detox mask. I’m also curious about the Salicylic Treatment Complex since I’m prone to breakouts. These sound amazing! I’d especially like to try the cleansing balm and the eye cream. My under-eye area can be dry and irritated, and I haven’t found an eye cream I love! I would like to try the Extreme Recovery Cream and the Vitamin C Complex! I have been wanting to try her products!! Just placed an order. Thank you for your recommendations!!! 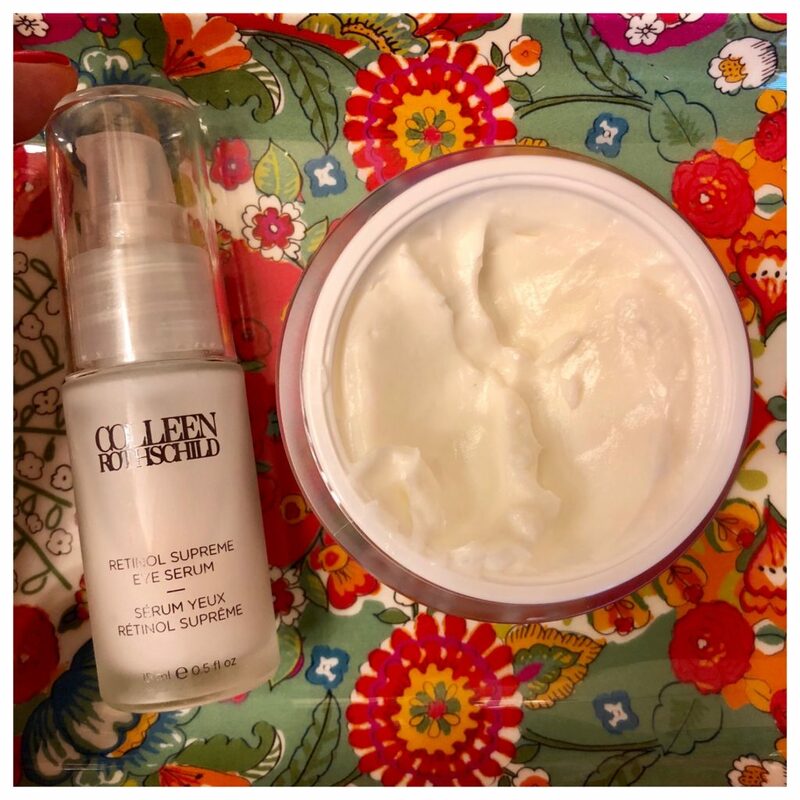 Ive never tried any Colleen R products but love trying new things, and I’m still looking for THE skincare to transform my skin! You’ve just confirmed what I already knew! I need these products! I’m looking forward to trying the Radiant Cleansing Balm and Dual Enzyme Polish most. I enjoyed the eye cream commentary however because the “older” I get, the more seriously I take “eye care”! Started with the discovery kit because of your recommendation and now have a full aresenal haha :). My favs are the detox mask and the sheer renewal cream and the super anti aging serum! Well all of it really! I just got the Sheer renewal cream 3 days ago but I already love it. Its light enough to wear under makeup but still leaves my face feeling moisturized. I don’t know why I didn’t listen to you sooner. I would love to try the vitamin c serum and any of the face masks. I am so excited to try more CR. I would try the cleansers (balm) and moisturizers (night)! I would try the balm cleanser and the night moisturizer! I ordered the travel kit to try out her products! Excited! I would love to try the detox. Mask and eye cream. Would love all of these products.. Thanks for sharing. My favorite product is the Dual Enzyme polish. Why? Because my skin feels like I just had a professional facial. It’s all amazing! I’ve heard great things about this skincare line but haven’t tried it yet. Loving your reviews on everything. I would love to try the retinol supreme eye cream and the mandelic acid radiance serum. At almost 48 I’m noticing some not so fun changes in my skin. Time to step it up! Gel cleanser in shower with Clarisonic. Discovery kit was fabulous way to try products and then buy what I liked! Been using for one year now and love it! I am finishing up my vitamin C by skinceuticals and would love to try this one all with the retinaol eye serum. I have not been able to find a retinol I can use around the eyes that doesn’t burn. I think I will order the travel pack today and get started. Thanks for the great information you provide us,a San enjoy your summer! You should be hosting a show on HSN! I’m ready to buy all! I think I’d want to try the eye serum, vitamin c serum and dual enzyme polish the most! I’m struggling with dark under eye circles and post baby acne and need help!! I want to try the Cleansing Balm and the Vitamin C treatment complex!! After reading that, I want to try everything!! I’d especially love to try the enzyme polish, detox mask, Vitamin C serum, and retinol! Does the cleansing balm remove eye makeup well?? I recently purchased the discovery kit and fell IN LOVE. My favorite is the cleansing balm – howwww is it so awesome?! 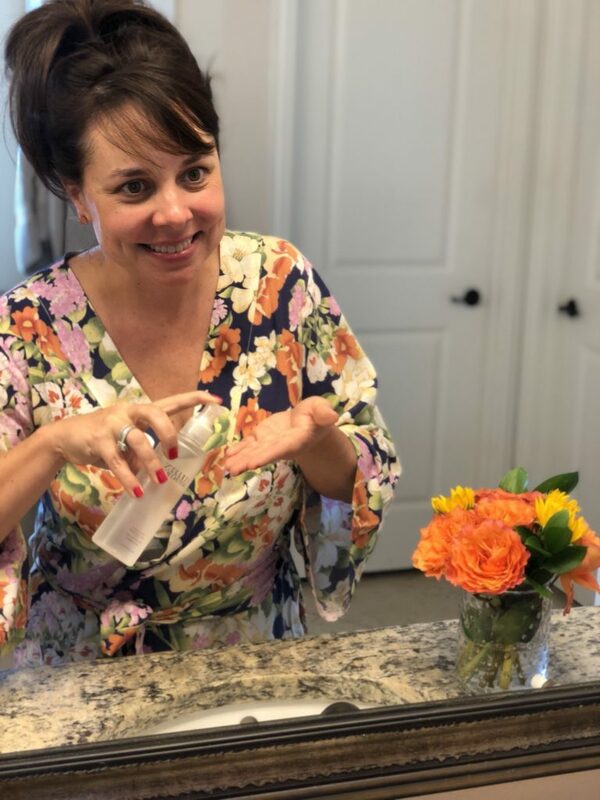 I love Colleen’s Balancing Gel Cleanser. It does a great job removing all my makeup without leaving my skin feeling dry! I also occasionally use the Cleansing Balm. I want to try the vitamin C complex and the retinol eye serum. All of these products sound amazing! I recently tried the charcoal mask and I love it! My favorite thing about it is the cooling sensation it has! It is very refreshing! I would love to try the cleansing balm and dual enzyme polish as well. I love the Sheer Renewal Cream. Hands down THE BEST moisturizer to wear alone or under foundation. It’s hydrating without feeling greasy. I swear my skin tone and texture have improved since I’ve been using this product alone! I haven’t tried it before but will now! I’d love to try the eye cream and the vitamin c serum. The dual enzyme polish and the radiant cleansing balm sound divine! So I ordered the cleansing balm a few days ago when you did a story and OMG! I have to say I wasn’t sold on how amazing it was but figured with 25% off I would try it. I love it so much! My face feels so clean without having that dry, tight feeling I get with most cleansers. I have used her retinol oil for awhile and I’m now going to slowly switch my entire routine to CR thanks to you!! It’s hard to choose my favorite as they’re all so fabulous, but I used to hate washing my face at night and I now look forward to it because I love the Cleansing Balm so much! I’ve never tried these products before, but officially headed their now to order! I have needed a new routine so I can’t wait to try, especially the radiant cleansing balm and the clarifying detox mask! I’ve never used her products but I’m dying to. I workouts love the vitamin C and night cream! Awesome giveaway! Your puppies are the cutest. My daughter and I have litter mate Springers! So much fun! I love the sheer renewal cream I use it daily for about 6 months now after you had recommended it a while back! I just started using the discovery kit and you’re right I actually look forward to washing my face now! I think I’m going to get the full size of the cleaning balm and extreme recovery cream but I really do like everything in the kit and would love to try more of her products! I’m obsessed with all the Colleen Rothschild products I’ve tried. I have the discovery kit & it’s great to see what you love. After using some of the discovery kit, I’ve purchased Radiant cleansing balm, extreme recovery cream, and shear renewal. I am slowly transitioning all my products into Colleen! Can’t wait to try Vitamin C as well as the eye cream! I have the cleansing balm and dual enzyme polish and love both. I just received the trial kit I ordered and can’t wait to try everything inside. My daughter has extremely sensitive skin, and these are the ONLY products we’ve found that work for her with no irritation. Thank you for the informative post! So cool! Would love to try these for the first time! I have been wanting to try Colleen Rothchilds products after reading such great reviews. 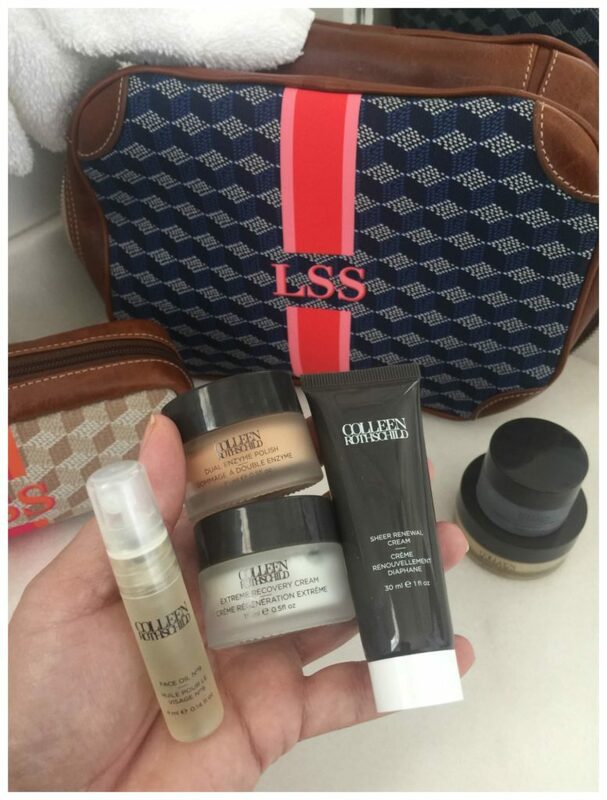 Haven’t had the opportunity to purchase them as of yet….would love to try the products before I buy them! Thanks so much for your review! This is all such helpful information! I want to try ALL of her products! If I had to choose 2 it would be the Retinol Supreme Eye Serum and the Vitamin C Treatment Complex. Dual Enzyme Polish seems like it will make my skin so soft! Love, love, love CR. Have been using some of the products for 6 months and have seen a noticeable improvement in my skin! Thanks for sharing your favorites! I love the dual enzyme polish and the clay mask. I would love to try the balm and no 9 oil! My favorite is the Radiance Serum, seriously a game changer. The first product that I tried and I had visible results within weeks! Love all of ge products I’ve tried so far and have all of your A.M. and PM routine products as well! Is my fave! My face always feels softer and tighter immediately after washing! Can I say the Discovery kit is my favorite!!! I love ALL her products. But really I would have to say the radiant cleansing balm and charcoal detox mask are my favorite. i LoVE the cleansing balm and sheer renewal cream. would love to try the vitamin c product and eye serum! Just ordered the discovery kit, but I’m super excited about the Radiant Cleansing Balm and the Clarifying Detox Mask! Thanks for the giveaway!! Hi! First off, I really enjoy how blog posts and your sense of humor. I, too, have extremely sensitive skin. I’m very hesitant to break away from my current skin care routine; however, I’m very curious to see if my face would do well with these products! I’d really like to try the Dual Enzyme Polish and also the eye cream/depuffer cream (whatever it’s called!). Also, a bonus would be trying the Discovery Kit! Please pick me—that’s my shameless plug! 😉 Thanks! I want to try the cleansing balm and sheer renewal cream. I love the Complete Eye Cream!! Would love to try the radiant cleansing balm and dual enzyme polish. Think I’ll order the Discovery kit so I can try a few things. I have to say purchasing the Discovery Kit started my love for this line. I fell in love with the cleansing balm and all the other included products. Since trying the kit I have purchased full size cleansing balm, rapid recovery cream, the clay mask, dual enzyme polish, the eye cream. 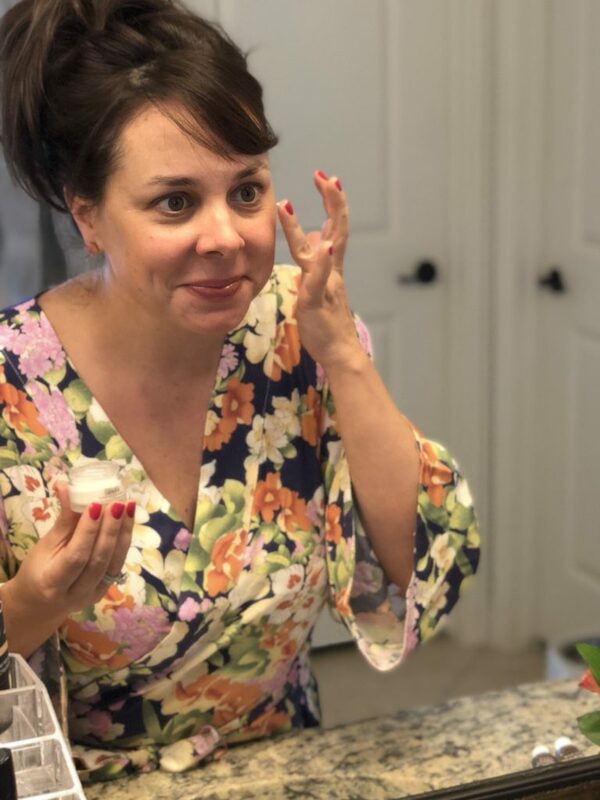 I have never been one to stick with a skincare routine and often would go to bed with makeup on (GASP) but these projects have changed that. I’m about three months in with never missing my routine . My skin has improved dramatically. Pores are smaller, random breakouts have cleared up and moisture levels have stayed even. I love these products! Thanks Scheaffer for introducing me to the line. I love to try the dual enzyme polish and the cleansing balm. I haven’t use this line. But, after reading this post I am interested and might just have to try the discvoery kit. I have some dark spot issues too, so I’d like to try the vitamin C treatment complex and the mandelic acid radiance serum! I ordered the Discovery Kit after your recommended it. The Extreme Recovery Cream is my favorite! I think I would be most interested in trying the vitamin C treatment to help even skin tone and the enzyme polish. I’ve been wanting to take the plunge and try the discovery kit for over a year now, but still can’t pull the trigger!! I would like to try the complete eye cream and any thing vitamin c! All of the products sound wonderful! I would love to try the cleansing balm as it sounds amazing and the eye cream for my tired eyes. Ive never Tried any of these products. Sounds like I need to get the sampler! I love the cleansing balm. The smell is so nice and it doesn’t dry out my already dry skin! I tried the Discovery Kit at the beginning the year and my skin never looked better!! It’s really pricey (for me), but so worth it to have great skin now and in the future!! The dual enzyme polish and the eye cream are so appealing to me! Ever since having a baby 10 months ago, my skin has had more issues than ever before! I’ve been looking for a new routine to start, and her stuff sounds amazing! I’ve been looking for a new skincare routine. It all sounds wonderful! I started using these products in December. I started with the discovery kit. All the products are amazing. A little goes a long way so it all lasts a while. The cleansing balm and the skin polish are my faves. My skin feels so soft. I’m turning 40 this year. So I need all the help I can get. I would love to try more of their products!! Cleansing balm & the eye cream! This stuff looks amazing! I started with the Discovery Kit a year ago and never looked back! Now have all of the products and love them! I bought the Discovery Kit after reading your recent blog post. So far I’m loving the Radiant Cleansing Balm and the Extreme Recovery Cream!! Would love to try the CLynnleansing Balm and a moisturizer! Thanks! I have been battling adult acne/rosacea for past few years. After a while my skin gets “used to” my current routine and symptoms return with a vengeance. Trying new products can be hit or miss for me but would love to give this line a try! I’m new to this line and would love to try the cleansing balm and detox mask. Thanks! I first tried CR discovery kit several months ago after reading about the products on your blog and I’m hooked! The texture of my skin has dramatically improved and I could never go back to my old routine. My faves are the cleansing balm, dual enzyme polish and sheer radiance cream. I’m looking forward to trying the balancing gel cleanser and the eye cream. Thanks so much for introducing me to this amazing skincare line!! This was a good post! I clicked over from IG because I knew you’d have a great infomercial perky review! I feel like they could hire you as a permanent spokesgirl! They should pay you double! Sorry for the extreme fangirling… you really did great on this post, and I’m a pretty loyal consumer of a different brand! Like to try the dual enzyme polish and mandeluc acid serum! I’d love to try the cleansing balm and eye cream!!! Oh my goodness, your puppies have grown so much!! So adorable! This post has been so informative-I’m a clean and clear girl right now 🙈 but have been wanting to branch out and try some “big girl” products! I’m not a fan of using more than 3 products at a time, but I may just be convinced with CR! I especially like that the products are formulated without parabens and SLS (among other toxins) *and* they seem to be so effective! I am very interested in so many of these products as I struggle with sensitive skin as well. I have dry areas so wondering if that oil would work well there. After reading your post, I was really interested in trying so many of the products! The Radiant Cleansing Balm and Dual Enzyme Polish might be a good start! I would love to try the sheer renewal and radiance serum. I am pregnant and my face is going crazy right now. I need all of the help I can get! Cleansing balm is my favorite, but it is hard to choose. Wanting to try the Vitamin C Cream next. Thank you so much for your in-depth review! I had never heard of this line before your blog. I’d love to try the Cleansing Balm and the Mandelic Acid Serum first. I just ordered the Discovery Collection today and then saw this post. I have never tried the products but have been wanting to ever since I started reading about them in several blogs that I follow. I look forward to trying the cleansing balm and the dual enzyme polish. Hi! Thanks for the post! I currently have no skincare routine and need to start one! I’d love to try the Radiant Cleansing Balm and the Sheer Renewal Cream, if I had to pick two! I would love to try the face oil and the eye serum. Thank you for this post! I have not tried these products yet but would love to try the clay masks and the oil #9. Thank you for all the info! I absolutely LOVE Colleen Rothschild products. I’ve been using them for almost a year now and can’t say enough good things about them. It’s so hard to choose a favorite but I absolutely love the radiant cleansing balm and the extreme moisture recovery. I’m so very glad I found this line. If you’ve been wanting to try them, do it. It’s worth every penny!! !